Unlike most postpaid plans today, Smart's new Freedom Plan will have no lock-in period, meaning subscribers can easily opt out of the service even after just a month of using it. The new Freedom Plan would allow users to establish their personal credit rating, a metric lending institutions and utility companies use to gauge the financial capability of a certain individual. 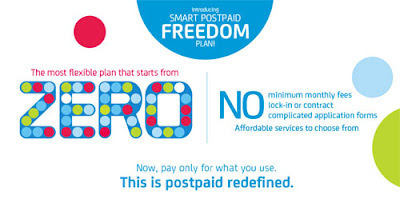 The Freedom Plan is a postpaid subscription that starts at zero pesos at the beginning of every billing cycle; hence, at the end of each cycle, you only pay for what you’ve used. Unlike most postpaid lines, it doesn’t come with fixed services. The plan really starts from a charge of zero pesos every month. So if you were vacationing out of the country or in some remote location, and you didn't use your Freedom SIM at all for one billing cycle, you don’t need a single centavo to foot your bill for that particular period. This plan also has Php600 credit limit which ensures everyone that you’ll never see outrageous amounts in your billing statement. In case you reach the Php600 monthly cap, you won’t be able to avail yourself of Smart’s services, as the service provider will temporarily redirect your line. If you want to reactivate it, you can do so by using Smart Money to cover your expenses. Or as ever, you can proceed to any Smart outlet and use real money to settle your account. And if ever you want to extend your credit limits from Php600, you’ll have to submit more requirements than the usual. Remember that you’re asking for a more-than-the-usual limit. Smart’s Freedom Plan is currently being offered as a SIM plan only, no device bundles for now, though that’s not entirely out of the picture, though it’s difficult to imagine how the company will offer the Freedom Plan without a MSF in that sort of setup. For more information about this Smart Freedom Plan, check this out : Smart offers a new budget postpaid plan for all - Smart Freedom Plan or log on to www.smart.com.ph/freedom.